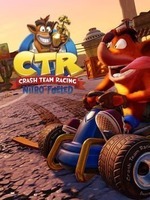 New gameplay footage of Crash Team Racing: Nitro Fueled reveals a massive graphical overhaul, the return of beloved features, as well as new elements. Notably, the developers are saying this is a complete remake of the 1999 game. No re-using assets or anything else. I think this is an ideal situation, recreate a beloved game while updating the graphics and sound.